The Paulick Report once again offers a special print publication for Wednesday's Fasig-Tipton Gulfstream Sale, which takes place at 3 p.m. in the Hallandale, Fla. track's paddock. In this edition of the PR Special, learn more about Florida Derby leading contender Audible, a $500,000 purchase at this sale a year ago. Frank Mitchell turns his Stallion Spotlight on Cairo Prince's first crop and gives us a few hip numbers to pay attention to in Five to Watch. On the horse care front, learn more about how to protect a horse against EHV and about dealing with shelly feet. Click here to read this Fasig-Tipton Gulfstream Sale edition of the PR Special. 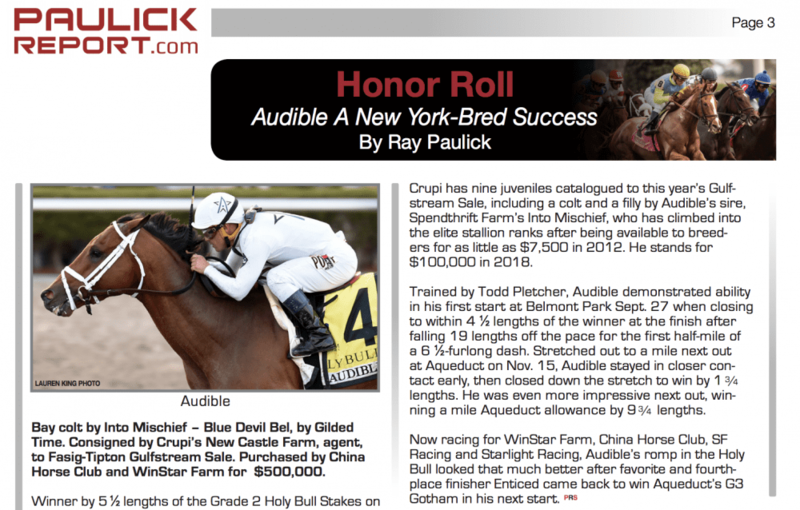 This entry was posted in PR Special, Ray's Paddock and tagged audible, Cairo Prince, ehv, fasig-tipton, Gulfstream Sale, PR special by Paulick Report Staff. Bookmark the permalink.